1918 was a watershed year. When the Great War finally came to a close, political systems were re-imagined and boundaries redrawn. Our first chapter is dedicated to war and politics; and Frank Borzage’s war drama Seventh Heaven (1927, screened in the Piazza Maggiore) is directly connected to the films from 1918. Important productions and newsreels come from Hungary, Czechoslovakia and Finland; like little flags they mark some of the new, independent republics on the changed map of Europe. From a watershed, the view opens on both sides. Chapter 2 on Russian cinema combines works looking to the future (by avant-gardists Majakovskij and Vertov) with a film-tale depicting the czarist period, Father Sergius. The destiny of Olga Rautenkranzová, Czechoslovakia’s first woman filmmaker and a protagonist of Chapter 3 dedicated to female filmmakers and screenwriters, reminds us that not only nations strove for independence, but also women, and that their struggle for equality in film production had a very long future ahead. 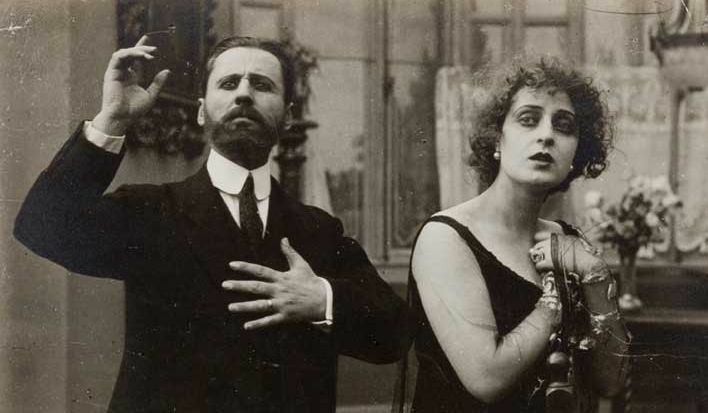 For Italian cinema, 1918 seems to have been a golden year. But the gorgeous diva films in Chapter 4 appear like phantasmagorical evocations of a past, doomed to fade. What did not fade are the shimmering colours of L’avarizia, starring Francesca Bertini, a black and white positive print, tinted and toned by Jan Ledecký back in 1991. A proof that the original techniques achieve not only the most accurate results for tinting and toning (as compared to the other ways of reproduction including digital ones), but also durable ones. Restoration techniques too should always look both ways, to the past and to the future. And what about the present of 1918? Nothing better for enjoying the present moment than popular entertainment. Adventure films, serials full of suspense, and comedies celebrating their darling actresses and actors delivered audiences in 1918 from the restraints of reality and gave them a good time. Join them and watch Tarzan in Chapter 5 and the resourceful Leah Baird, chasing the evil Wolves of Kultur through fifteen episodes, in Chapter 6. If you prefer to cling to your idea that Germans silent films are artistic but gloomy, better refrain from seeing the wonderful finds from 1918, German comedies (or parts of them) screened in the section Recovered & Restored, with brilliant Ernst Lubitsch, irresistible Hedda Vernon and versatile Henny Porten in the double role of a stage-struck cook and a tipsy countess. The attentive guest will discover how the strands of the festival are connected, for example, by art director Ben Carré. Film-historically speaking, the major event of 1918 was Carl Theodor Dreyer directing his first film. Praesidenten was released in 1919, and it is the first title we put on our list for the 2019 programme A Hundred Years Ago.